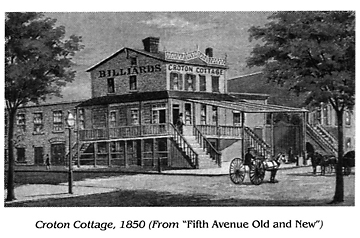 "In the years following the opening of the Aqueduct it was made the end of the afternoon drive from St. John's Park, Second Avenue and other fashionable sections, and Croton Cottage provided ice cream and other refreshments. It also had a curious 'maze' in its garden which greatly interested the country visitor. It was destroyed by fire during the draft riots..."
"The Old Croton Aqueduct [reservoir)- the most famous Metropolitan structure of its time-extended from 40th to 42d Street, on the land now occupied by the imposing building of the New York Public Library. "The year 1842 marked what was perhaps the greatest forward stride in the city's history-the general introduction of running water . . . that stupendous improvement . . . When the reservoir was first completed it had a spacious promenade all around the top of the walls upon which gay and animated groups constantly gathered. Old letters speak of the delightful scene at night, with the moonlight dancing on the water. In the daytime, charming views of Long island, the distant hills of Westchester, and the lordly heights of the Palisades provided a fascinating panorama. . . ."
Barbara McManus of the Hastings Historical Society notes that Henry CollinS Brown lived in Hastings and was one of the founders of the Museum of the City of New York.